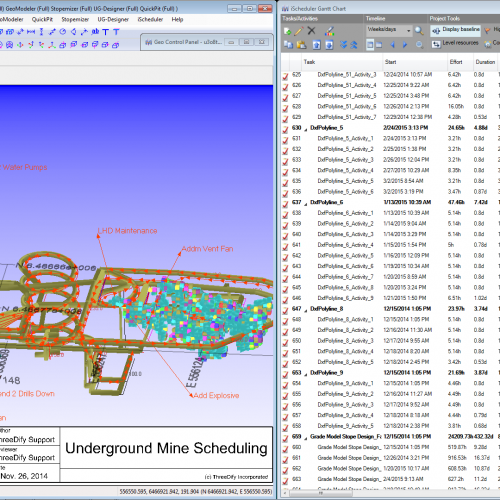 From nested pits and/or stopes to Gantt Charts, GeoMine iScheduler is an integrated activity and resource based 3D mine production scheduler for surface and underground mine scheduling. It features a fully interactive 3D activity and dependency editor, activity and resource Gantt Charts, a PERT chart and a Network Diagram, as well as a Resource Leveling algorithm. 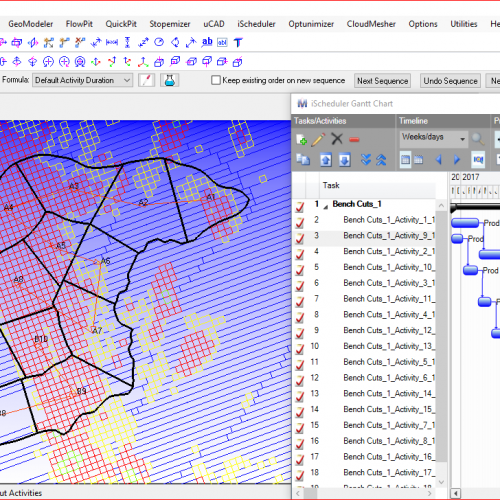 iScheduler is purposely built for sequencing and scheduling various kinds of mining activities and resources for short to long term (non-strategic) planning of open pit and/or underground mines. Activities and dependencies can be generated automatically or manually through its powerful interactive Activity and Dependency Editor that supports unlimited undo/redo. 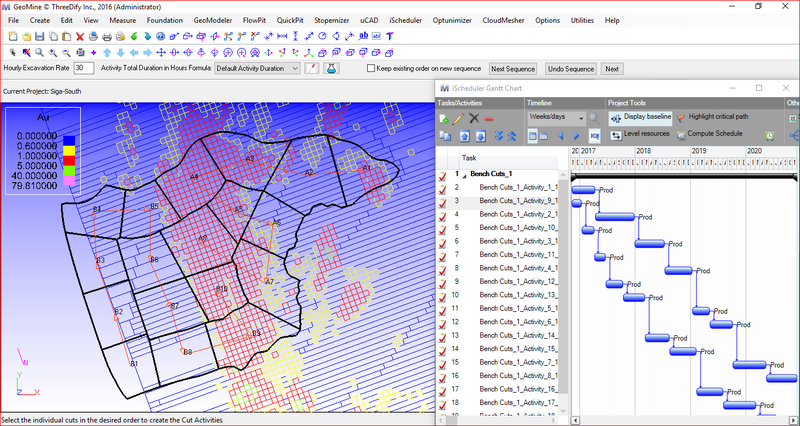 Interactive scheduling for short to long term (non-strategic) planning of both surface and underground mines with support for multiple block models, stope designs, bench mining cuts, mine development layouts and stockpiles. Calendar based activity and resource schedules with Gantt Chart, PERT and Network Diagram representations. Interactive Activity and Dependency Editor for creating associative 3D activities and dependencies from various mining objects. Manual and/or automatic activity sequencing and Resource Levelling. Schedule animation including playback, pause, resume, fast forward and backward. Generation or importation of nested pits to create practical pit sequences for long-term planning. Two-way interface with Microsoft Project through XML format.